Large blade area and chisel blade tip and weight matters, and in a Rocna anchor every gram of metal is put to use. A large concave surface blade area offers superior holding power, and the chisel-like blade tip easily penetrates weed, grass and kelp. Ease of use - A Rocna self-launches and locks home on most bow rollers. A tight curve radius between the shank and blade give a positive lock, preventing movement at sea. The slotted shackle attachment point allows single-shackle fixing, and special holes are positioned for a buoyed retrieval line and tandem anchor, if required. Roll-bar - A Rocna's roll-bar ensures that the anchor will turn itself to the correct attitude for setting every time. The skid-rails then direct the blade into the seabed. 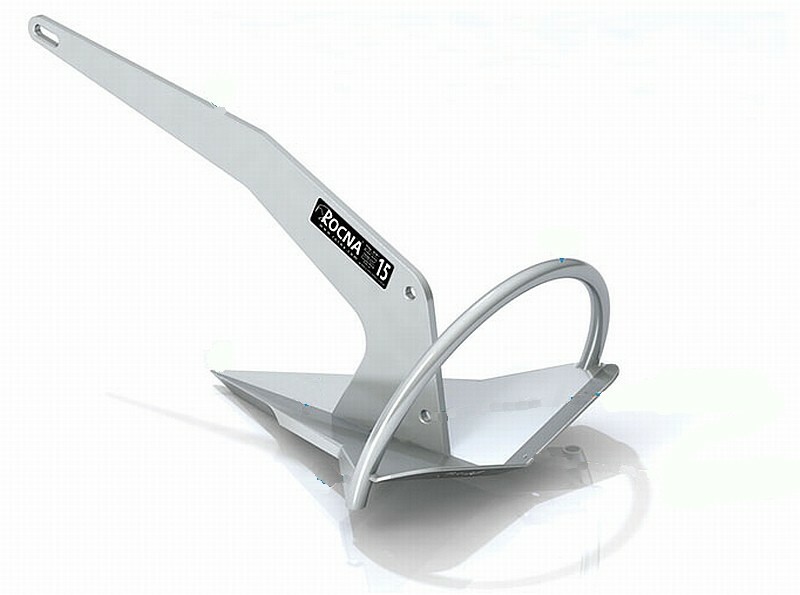 This also eliminates the need for dedicated tip-weight an inefficiency common in other designs Versatility - There is a Rocna to suit your boat, whether she is a small runabout or a vessel displacing 50 tons. Appeal - A Rocna has a distinctive and smart look that complements and enhances any craft. Rugged strength - The heavy-duty construction of a Rocna is attained through clever design and the use of high quality steel. A Rocna is rock solid with no moving parts, eliminating complex adjustment systems and potentially dangerous failure points. Durable - A hot dip galvanized finish covers the entire surface of every Rocna with protective zinc, including the interior of the hollow rollbar. Rocna. Rock solid in every detail. The Rocna was designed to address the limitations shared by all older and most newer anchors available. These designs suffer from a combination of the following: Limited resistance and holding power due to small blade areas inefficient distribution of weight. Blade shapes designed to furrow, i.e. to move through the ground. Poor penetration in difficult seabeds such as kelp and grass. A tendency to roll-out under heavy or veering loads, especially common in claw and Danforth-style flat blade types. Poor designs that do not consider stowage on your boat s bow, resulting in slack fits that allow movement at sea which can be damaging as well as annoying. Insufficient strength in the shank or other load-bearing sections. Moving parts, i.e. a reduction in strength and a hazard to personnel. The Rocna successfully addresses each and every one of these points, amongst others.